The Marketing Heaven is a UK-based social media promotions company. They provide different YouTube services, including video views, likes, and comments. The company claims to maintain an extensive network of social media users that promote your YouTube videos, letting you gain good-quality views. What we like about The Marketing Heaven’s YouTube views service is that you get separate plans for international and country-specific views. The packages they offer for each category are sizeable and will accommodate specific needs. The company says that all the views come from real people they engage through promotions. Their customer support is underwhelming with their live chat panel being unusable, and having slow message responses. This is offset by the fairly good refund and retention policies they have. The Marketing Heaven is an ok option for good-quality targeted views for your videos, but you may want to look at more of our top view providers before making a decision. The Marketing Heaven was established in 2014 in the UK. 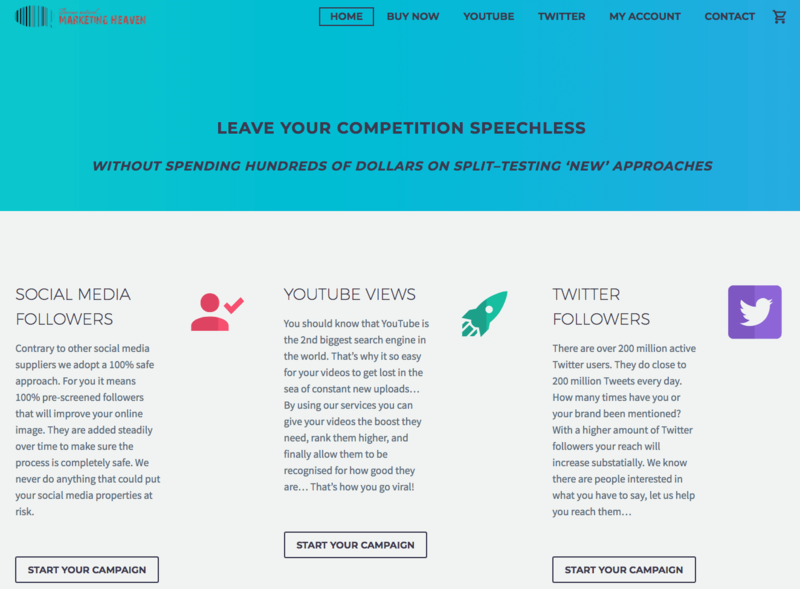 Their goal from the start was to provide different social media promotions services. For YouTube, they have separate offers for international and country-targeted video views. They also have likes, shares, and comments. The other platform they cater to is Twitter, so YouTubers who tweet will like them. The company claims to run an extensive network of social media accounts to promote your videos. They say this setup helps attract views from real people. The company claims to have helped thousands of clients through their strategy. The Marketing Heaven offers separate packages for international and country-targeted views. The international views plans have 5000 to 1 million views, while the country-targeted views are between 1000 and 20,000 views. Smaller packages are delivered within 1 to 2 days while larger ones can vary in delivery time depending on the size. The site accepts payment through major credit cards and Bitcoin. 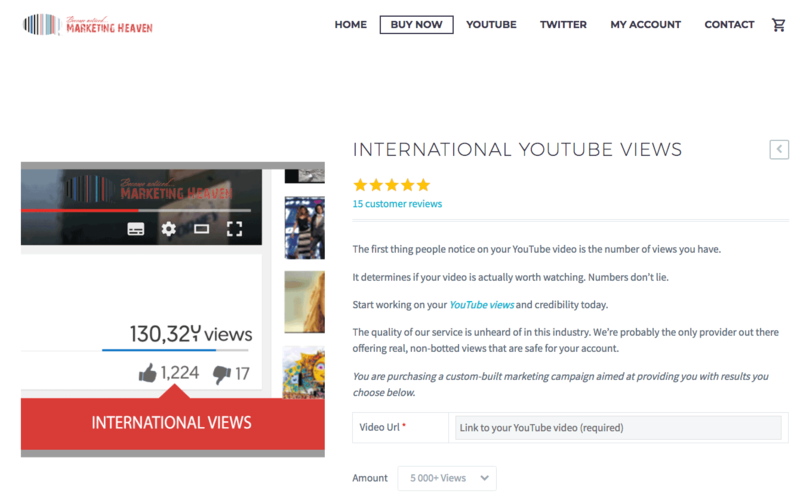 The Marketing Heaven lets you add video likes to the views packages you buy. We reviewed the terms and conditions sections on the The Marketing Heaven website and made a few comments on their status below. To find out more details on these, then please toggle the sections to see what we thought! The Marketing Heaven provides a very detailed declaration of its Terms and Conditions. They state that there is no warranty because they will always be able to meet client demands and expectations. They reminded that you are using their services at your own risk. The site also states that they have no liability for any damage that might be caused to your account when using their services. They also say that it is your duty to provide accurate registration information to avoid issues. The Marketing Heaven states that they process different types of data related to your transactions, including your name and email address, as well as additional personal information you might provide upon request. They also store technical information related to your use of their site through cookies. They assure that all of this data is stored securely and only used to deliver their services. The Marketing Heaven also says that they might disclose some of your data under certain circumstances. These include situations related to the delivery of their services and those that pertain to legal matters. You can request to have your personal data removed from their servers if you don’t agree with this arrangement. The Marketing Heaven offers a 100% money back guarantee if the campaign you purchased or the expected views do not come within 30 days after your purchase. Contact their customer support staff for refunds. The Marketing Heaven provides a 30-day replacement warranty in case your view count drops during the campaign period. The warranty period starts from the date of initial delivery of your order. The Marketing Heaven provides an on-site contact form you can use to send inquiries and comments. They also claim to have a live chat panel but it seems to be offline as of this writing. Additionally, the site provides the addresses of their offices in the United Kingdom and Hong Kong. We sent The Marketing Heaven a few questions to test their customer support. 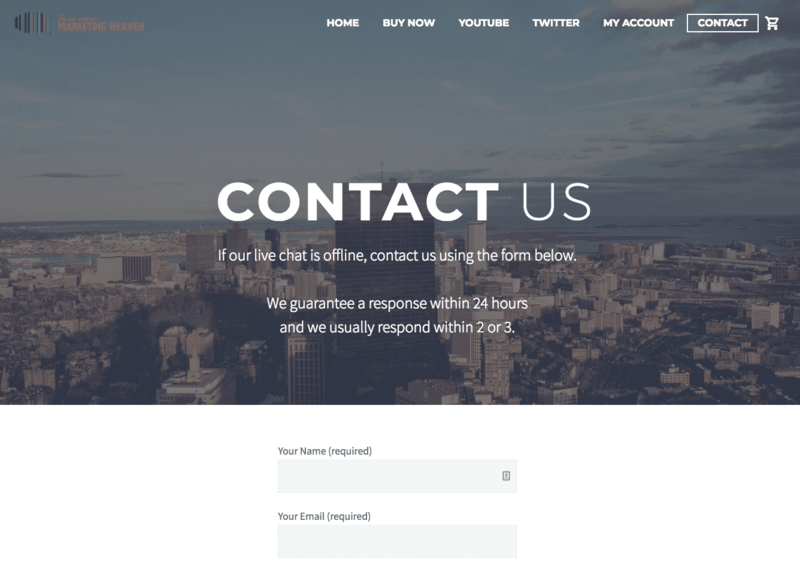 We were disappointed that they had no live chat, as many of the top providers do, and their response time was slow to message sent via the contact form. We will update this section after our order completes. We recommend The Marketing Heaven if you want to get good quality views to boost your YouTube video’s popularity. They offer both international and country-specific views, which gives you greater targeting opportunities. To see how they stack against some of the best providers around, you can check out our list of providers. The Marketing Heaven states that they can complete the delivery of smaller views packages within 1 to 2 days after purchase. Larger packages will vary in delivery time depending on the number of views to be delivered. Delivery starts within 12-24 hours after you order. The Marketing Heaven claims to provide high-quality views coming from actual people. They use a network of social media accounts to promote your videos and draw the interest of these viewers. The Marketing Heaven explains that viewers will watch at least 70% of your video, which is a decent rate if our testing proves it to be true. The Marketing Heaven’s YouTube video views packages are impressive. We especially like the fact that they offer international and country-targeted views as separate package groups. This means you can get the right plan for your needs easily. The sizes for each package are also admirable, with the International Views packages going up to 1 million views. Their offers are backed by decent refund and retention guarantees. We wish that these guarantees were longer, but they will fill most needs. Customer support is the site’s weakest aspect. They claim to have a live chat option but it is not available at the time of this writing, or in the past. The only available option is a contact form. Even with these issues, we still recommend The Marketing Heaven if you want to get good quality views that will attract the attention of more audiences. Find out more about their services by clicking the button below and paying them a visit.